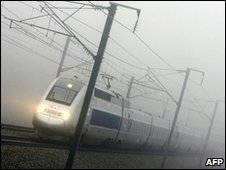 Three directors of French transport and infrastructure group Alstom have been arrested in a UK corruption probe, the Serious Fraud Office says. The arrests followed a raid on Alstom offices in Ashby de la Zouch and Rugby. The SFO said in a statement it believed bribes had been paid in order to win foreign contracts. Alstom said the raids were part of an investigation by the Swiss authorities into alleged bribery in the late 1990s involving a Swiss banker. The three men arrested during the operation are aged 52, 51 and 44. They were later released on police bail. Swiss officials raided Alstom's offices in Switzerland in 2008 and the company said these raids were related. The UK operation, code-named Operation Ruthenium, was into "the suspected payment of bribes by companies within the Alstom group in the UK," the SFO said. The operation involved 109 SFO staff and 44 police officers and financial investigators. In May 2008 Alstom denied that it was being investigated over allegations it paid bribes to help win overseas contracts, when responding to an article in The Wall Street Journal. The newspaper alleged that bribes were paid between 1995 and 2003 from "shell companies" based in Switzerland and neighbouring Liechtenstein. It said money was then given to people working for Alstom in Singapore, Indonesia, Venezuela and Brazil. In one specific case, it was alleged that Swiss and Brazilian police had met to discuss suspicions that Alstom paid $6.8m (£4.5m) to help win a $45m contract to expand Sao Paulo's underground network. Alstom is an engineering firm that makes everything from trains to power stations. Its sales during for the nine months to 31 December 2009 were 14.4bn Euros (£12.9bn).